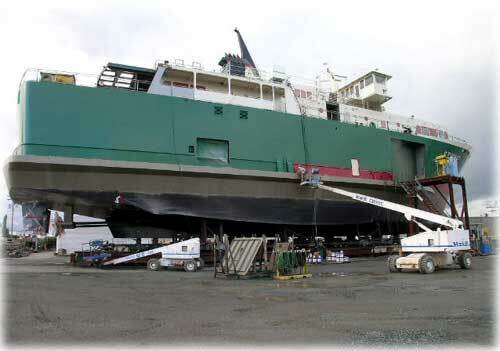 Ketchikan, Alaska - Painting of the M/V Stikine was recently finished, just in time for the upcoming christening and launching ceremony scheduled for January 21, 2006. The Stikine, the second vessel in the fleet of the Prince of Wales Inter-Island Ferry Authority, will be christened at the Dakota Creek Industries shipyard in Anacortes, Washington, with Alaska's First Lady Nancy Murkowski attending. Dakota Creek Industries began the project in February 2005, with approximately 80 employees working on the project. 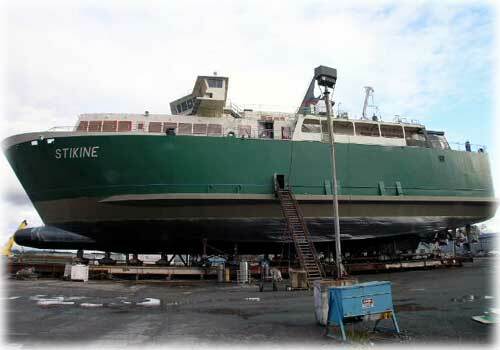 All work on the Stikine is expected to be finished to meet a March 2006 delivery date. The M/V Stikine is being built in the same Anacortes' shipyard as the Inter-Island Ferry Authority's M/V Prince of Wales. Funded through a $17 million federal grant, the passenger and car ferry will serve the IFA's northern route, linking Coffman Cove, Wrangell and Petersburg.. The ferry will hold 30 standard vehicles and will be licensed for 195 passengers. When the vessel is complete it will weigh 990-tons with a length of 200-feet. The Stikine can be crewed by five people and it is projected to have a 20- to 30-year economic life. Enhancements to the new vessel include an upgraded passenger deck layout, larger wheelhouse with enclosed bridge wings, more powerful bow thruster and a third generator. The wheelhouse on the Marine Vessel Stikine will look somewhat different from the M/V Prince of Wales due to a major change. The sides of the wheelhouse now extend all the way out to the edge of the vessel ( like wings ). This will make docking somewhat easier, especially in bad weather, as the skipper will to able to walk out to the edges for a better view. After launching, there will be a final outfitting, sea trials and testing the mechanics before her expected delivery in March 2006. According to Len Laurance, Marketing Manager of the Inter-Island Ferry Authority, scheduled service between Coffman Cove (where the vessel will overnight), Wrangell and Petersburg will commence May 18, with a round-trip every Thursday, Friday, Saturday and Sunday, through September 17, 2006.